■ Going to be working on finishing up my requests tomorrow! I have a busy week/weekend coming up so I'll be keeping requests closed until next week. ■ I have a new font site affiliate! Go check out Canvas for some beautiful picture fonts. 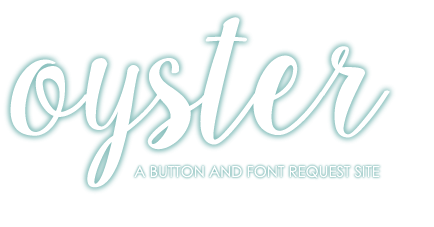 Welcome to Oyster, a button and font request site by Missy. I love making fonts and buttons here on Neopets, so I've decided to create a site where I can give to the community while doing something I love. My site used to be very casual, called Missy's Graphics. There might still be some of my old link back buttons floating around out there. Since I started branching out further than my guild, a more professional look was desired. Take a look around, thank you for visiting and enjoy! button or font request is complete! 001. The first rule isn't really a rule, but something that you should know. I typically only work on requests on the weekends as I am quite busy during the week. 002. I will respond to your neomail to let you know that I have received it. If you don't hear from me within 48 hours, please submit your request again. 003. Do not claim my fonts or buttons as your own. You didn't create them, you don't own them. Easy, right? 005. Please only submit one request per form, and one form per neomail. It makes it a lot easier on me. 006. You can request up to two items at a time. Whether it's two fonts, two buttons, or one of each! 007. I will only use Neopets images on my buttons. 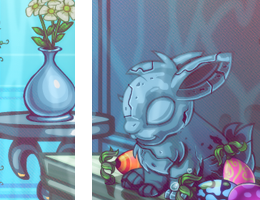 You can find a whole slew of them here: x, x, Dr. Sloth's Neopets Image Emporium, or any item on the site. 008. It's best to save your button or font to your computer, that way if you ever lose it, you have it backed up. I can reupload buttons if needed. 009. If I made a mistake on your button, please let me know so I can correct it! * This rule is mainly for buttons. I don't really expect people to put a link back to me for fonts! If you want to, that's cool, but it's not needed. So you're looking for a button! You have two options: a custom request, where you pick out everything, from animation style to border type; or a blind request, where you leave all the options up to me. Feel free to check out my portfolio for inspiration. If you would like to submit a custom request, please fill out the form below and send it to me via neomail! I will respond once I've received your request. If you would like to submit a blind request, please fill out the form below and send it to me via neomail! I will respond once I've received your request. You want a font, and you've come to the right place. There's only one request form, and it's pretty simple. After I've finished your font but there's some minor tweaks you want, feel free to edit your font however you wish! Keep in mind, I still created it so you can't take credit for making the font if you do decide to change some things up. I would also like to point out that I do not make block fonts. They're too complicated for my brain and they look different depending on what computer you're using. To give you an idea of my font style, I've included some of my favorite examples to the right. If you would like to submit a font request, please fill out the form below and send it to me via neomail! I will respond once I've received your request. Content created by Missy. Background image by Silent Serenity. Bullets by Roo. Button textures by: backtalking, avidkad and faeriepuffs @ dA.